Mathias Keller was born in 1979 in Lausanne. After obtaining his Master of Law, he worked as a clerk at a Prosecutor’s office and as a clerk in a Court of first instance. He performed his lawyer training in a law firm in Lausanne, passed the bar in 2007 and then worked as an associate in Pache & Henny law office. In 2012, he joined DBK Avocats as a partner. After beeing certified Specialist SBA Construction and Real Estate Law, he then became a partner in Leximmo. 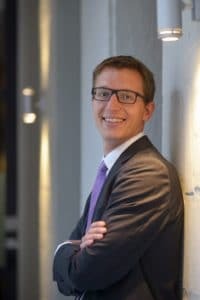 Mathias Keller practices as an attorney at law within the jurisdiction of the Canton of Vaud and of the Federal State of Switzerland. He is specialized in the area of Construction law, Planning law, Real Estate law, Rural land and Agrarian law, Environmental law, Neighbourghood and Rural law. He remains a general practitioner lawyer in Labour law, Contract law, Family law and Criminal law.